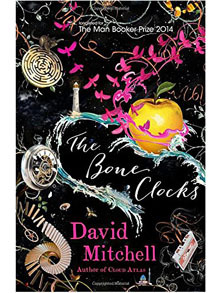 The Bone Clocks by David Mitchell: Review. Take The Thousand Autumns of Jacob de Zoet out of David Mitchell’s six strong canon of work and you are left with sublime mastery. The Bone Clocks may well be his masterpiece. It’s a sort of reworked Cloud Atlas but with even greater ambition, wider scope and a novella within (six actually) that combines fantasy and science fiction in a way that few others, not even the late Iain (M) Banks, with his ability to switch genres, could achieve. These six inter-connected novellas tell the life story of Holly Sykes from our introduction to her a sixteen year old in the badlands of 1984 Kent, to her old age (set in 2043 in a dystopian climate change driven western coast of Ireland in a walled off community that is about to implode). The final ‘book’ shares a strong sense of mood with McCarthy’s masterpiece, The Road. The journey takes in a cast of characters’ tales that range from hilarious to minds boggling; we meet a bunch of London city type toffs lording it up in a Swiss ski resort, one of whom becomes a vicious and callous critic in the next book and suffers the consequences by becoming an author and facing a lifetime of failed follow ups to his seminal debut. Another brilliantly captures the horrors of war following the life of Sykes’, devoted to his work- not his wife, husband as a war correspondent during the Iraq war. But the central ‘book’ in all this and the one that glues the other five together is the sprawling sci-fi/fantasy book #5 that follows the war between two tribes; The Horologists and the Anchorites in which they live parallel existences across time (one is over 2,500 years old) and use different methodologies to reproduce; one essentially ‘good’, one ‘bad’. It’s a breathtaking story that rewards the graft of understanding their jargon, but that’s sci-fi for you. The finale is wonderful as the loose ends tie up we get a real insight to Mitchell’s big themes around sustainability, good versus evil, religion and the driving secular forces of humanity. You might not buy this but you’ve got to admire its exposition. It all adds up to a reading experience that few, if any, could replicate. One can see why it didn’t make the Booker shortlist but that doesn’t mean a jot. This is writing of the very highest order with not a hint of literary pretension, in keeping, I feel, with the man himself. Bravo, David Mitchell. And thank you for this. Love love love this book. Such a wonderful read! Mitchell is a master. Thanks for sharing!